Date: April 28, from 11am-4pm – all welcome. Meeting: Meeting time and location will be circulated closer to the event time. Please bring your own packed lunch and wet weather clothing and boots. A €20 donation is appreciated to cover the cost of the visiting European ProSilva foresters. David, Mary and family have a range of forestry plantations all of which are being transformed to Close-to-nature continuous cover forestry. In the morning we will be visiting a high Yield Class stand of Sitka spruce planted in 1990 which to date has received 2 transformation thinnings using the Graduated Density System defined by Talis Kalnars. We will be discussing the next steps as the 3rd thinning is imminent. We will also visit a small mixed hardwood stand and another poor quality mixture of Ash and Noble fir. We will be joined on the day by Marc Etienne from ProSilva France and by another ProSilva expert from Europe, to be confirmed. The 2012 members subscription of €40 is now due. €10 for students/unwaged. Please send this to Pro Silva Ireland, Membership Secretary, 36 Fitzwilliam Square, Dublin 2. Out autumn open forest day is set for 6 Oct 2012 in or near Northern Ireland and our overseas trip for members will be in early Sept to the South of England. Details of these events will be in subsequent posts. 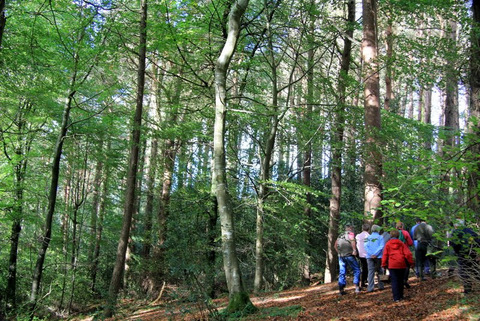 Next Entry Upcoming April 28th 2012 Open Forest day in South Leitrim – All Welcome!